Q3 2011 Online & Mobile Industry Trends - Berkery, Noyes & Co., LLC. The most active acquirer through Q3 2011 was Google Inc. with 17 acquisitions, 6 of which occurred within Q3 2011: DailyDeal, Zave Networks, The DealMap, Pittsburgh Pattern Recognition, Fridge, and Punchd Labs. The largest announced transaction for Q3 2011 was Kohlberg Kravis Roberts & Co. and Silver Lake Partners’ acquisition of GoDaddy.com for $2.25 billion. There were 139 financially sponsored transactions in the 1st 3 Quarters of 2011, with an aggregate value of $9.72 billion, representing 11 percent of the total volume and 20 percent of the total value, respectively. Total transaction volume in Q3 2011 increased by 9 percent over Q2 2011, from 411 to 447 transactions. 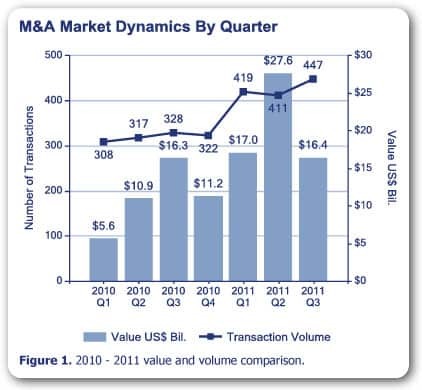 Total transaction value in Q3 2011 decreased by 41 percent over Q2 2011, from $27.6 billion to $16.4 billion. 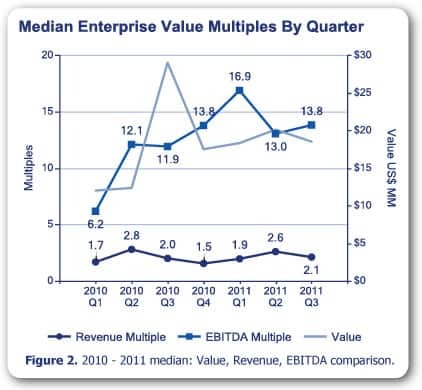 Median EBITDA multiples rose from 13.0 in Q2 2011 to 13.8 in Q3 2011, a 6 percent increase. Median revenue multiples went from 2.6 in Q2 2011 to 2.1 in Q3 2011, a 19 percent decline, while median value saw a similar decrease. The top ten deals by value have increased since our half year report, with three acquisitions entering the list from Q3 2011: Kohlberg Kravis Roberts & Co. and Sliver Lake Partners’ acquisition of GoDaddy.com, Web.com, Inc.’s acquisition of Network Solutions, LLC and Electronic Arts Inc.’s acquisition of PopCap Games. 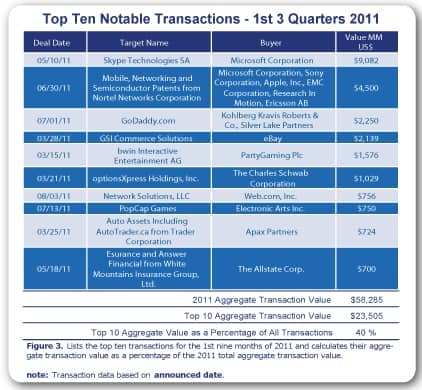 These three transactions, with an aggregate value of $3.8 billion, represent 6 percent of transaction value in the 1st 3 Quarters of 2011, and 28 percent of Q3 2011 transaction value.